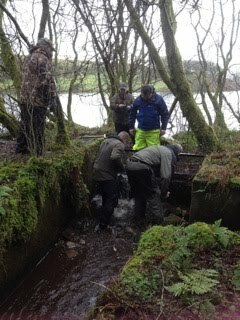 Committee Members can see seen in the picture to the left involved in a work party at Milldam today. They were clearing existing inlet and outlet channels of debris to ensure a good flow through the water. Fences were also reinstated on the dam that had been damaged by cattle over the winter. Members involvement work parties is essential to ensure that small general maintenance is carried out at least cost to the club. In the near future, further work parties will be organised for general maintenance, weed clearance etc. at both Lindowan and Milldam. Members wishing to help should contact Alan Hier for further details. E-mails will be sent out to members prior to each work party asking for support. So please watch out for notice e-mails.